WEEDSPORT, NY – The Spano Container Sportsman Shootout Series returned to Weedsport Speedway on Sunday, joining the ESS Legends Reunion with Connor Cleveland showing the way in a tremendous battle with Zach Sobotka, to score his second win of the season at the Port worth $1,000. Cleveland took advantage of a stout qualifying effort and redraw to start from the outside of the front row with DJ Forbes, darting to the lead from the drop of the green, never looking back. From there, Cleveland held off Sobotka on a late race restart to claim the win by just .555-seconds. Spano Container Sportsman Shootout Series point leader, Dave Marcuccilli, finished in the third spot behind Cleveland and Sobotka with Matt Guererri and Nick Krause finishing the top five. Kevin Root, Corey Barker, Jackson Gill, Michael Stanton Jr. and Jessica Power completed the top ten runners in the 24-car field. The night’s first caution would wave on lap 2 for Henry Desormeau, who spun in turn one. A quick turn around saw the green lights come back on with Cleveland and Krause checking away in the lead, however it was Marcuccilli charging through the pack early from ninth position to take fifth. Two more quick cautions would slow the field before lap ten with Cleveland now leading Sobotka, Krause, Marcuccilli, Gill, Forbes, Barker, Guererri, Will Shields and Power. Following a lap eight caution for Austin Germino, the race began to fall into its paces with Cleveland continuing to be in charge at the front. Further back Gill was starting to move forward in the No. 60, sliding by Marcuccilli for fourth on the restart. As the race pushed on it was clear that Cleveland was the favorite, but Sobotka and Krause were showing signs of improvement as they pulled away from both Gill and Marcuccilli. With less than ten laps to go Krause was really coming alive, looking to the outside of the race track for a way by Sobotka into second. But, two consecutive cautions on laps 19 and 20 slowed that momentum with a five-lap shootout left for Cleveland, Sobotka, Marcuccilli, Krause, Guererri, Gill, Barker, Root, Power and Stanton. Seeing his chance at a win, Sobotka hammered the outside of the race track for five consecutive laps looking for a way by the No. 09, but it wasn’t meant to be as Cleveland charged to the win. 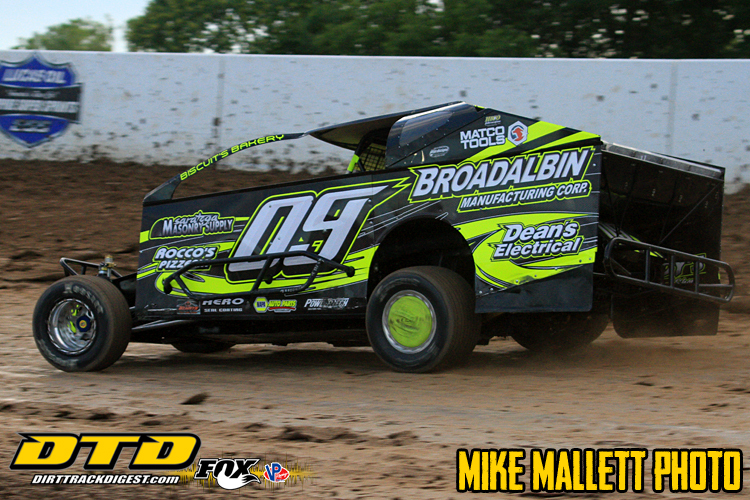 Heat race victories went to Root, Forbes and Marcuccilli. 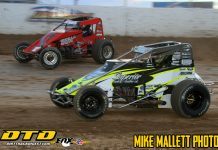 The Spano Container Sportsman Shootout Series will conclude on Wednesday, October 3 with the Super DIRT Week Kick Off Party featuring the DIRTcar 358 Modified Series and the DIRTcar Sportsman Series. 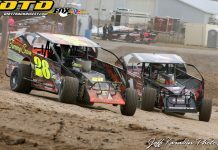 Steve Poirier won the ESS Legends Reunion A-Main over Chuck Hebing and Jason Barney on Sunday. Poirier took advantage of a faltering Lucas Wolfe, who led in the early going. From there, Poirier worked through traffic with ease over Hebing, Barney, Billy VanInwegen, Jeff Cook, Danny Varin, Joe Trenca, Paul Kinney, Matt Tanner and Tommy Wickham. 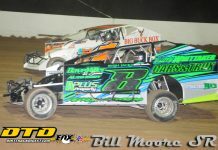 For more information on Weedsport Speedway visit www.weedsportspeedway.com.